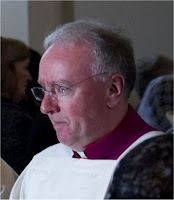 Mgr Philip Egan has been appointed as Bishop of Portsmouth - announced at Roman noon today in the Bollettino. Mgr Egan and I were in the same year at the English College back in the day. He is a thoroughly sound chap and I am delighted that he has been given this responsibility by the Holy Father. Mgr Egan taught theology at Oscott for many years, has had wide pastoral experience, and more recently has been Vicar-General to Bishop Mark Davies of Shrewsbury. I am sure that the clergy of Portsmouth will find him a friendly and approachable Bishop. May God bless and protect him in the new task he has been given by Our Lord.